As a child, history wasn’t a strong topic for me. I remember the transition from social studies to history and the frustration at having to memorize meaningless events and dates. I never managed to care in which year Washington was born. I have never benefited from memorizing the exact day a war began or a country was founded. For me, and many others, history lacked context and meaning. We were meant to memorize and not comprehend. 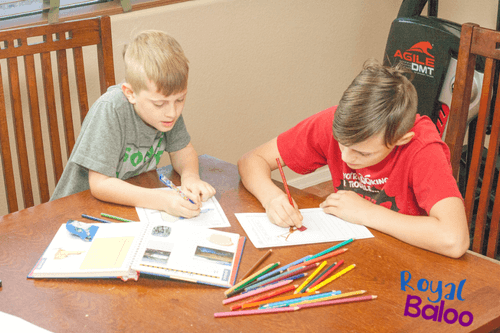 So I knew when we started focusing on history in our homeschool it wasn’t going to be about dates, it was going to be about people and the effects of events. It would never be about memorization but about conversation and empathy. However, dates are fairly important in any history lesson. If we aren’t memorizing exact dates, understanding what events happened before, after, and at a similar time is helpful for understanding the greater meaning of history. It would be hard to understand why people were willing to travel to America on a risky boat if you didn’t learn about what was going on in Europe at the time. 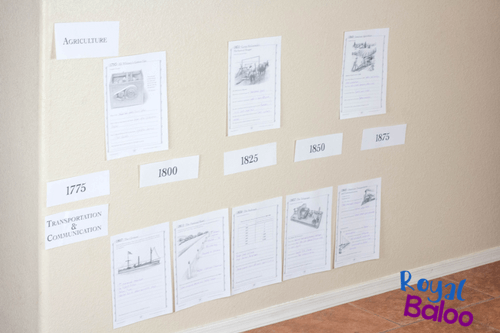 Timelines are a great way to bring dates in history to life for kids. Then once you’ve filled out the page and discussed the telegraph, why it was important, how it was used, and imagined how it may have impacted life back then, you place the page on the timeline. At this point, you (or your kids) might notice other events that happened around the same time. Like the great expansion of the railroad system. Could we have had such a great railroad system if we couldn’t have communicated so well with the telegraph? 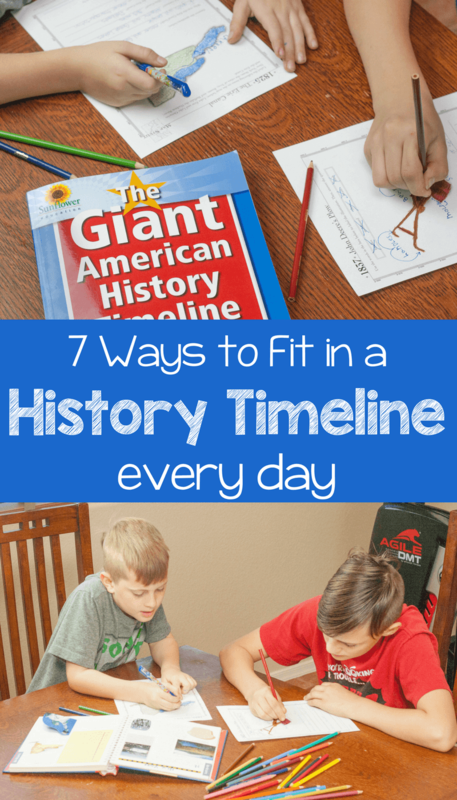 The Giant American History Timeline breaks down America history into eras. The eras are further broken down by topic (i.e. communication and transportation) and then by specific subjects. This set makes it easy to pick up the timeline and work a little bit at a time. 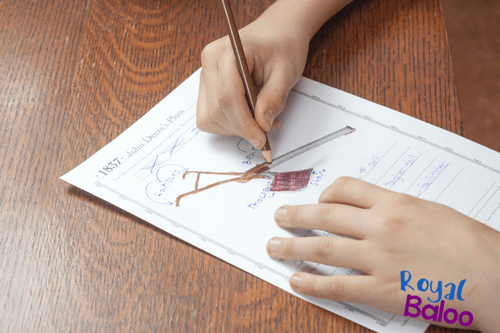 Or work on multiple pages and concepts for a longer lesson. I know it’s hard to fit history and timelines in every day but I think it’s worth putting some time and energy into. History is such an important topic but it has to done with context and connection. These timelines prompt conversation and lead to comprehension. So I’ve suggested 7 ideas to fit this timeline into your every day practice. 1. Study alone time. We are trying to find more time for our oldest (Baloo at 11) to work on his own. These timeline pages are perfect for studying alone at the middle school age because they provide a framework of information to find. But it would be up to him to read books or look online to fill in the info. 2. Keep it accessible. Timelines are much easier to forget if you can’t see them or they’re hard to get out. So keep them somewhere easy to access. If you have the wall space – use it! Timelines look fantastic on walls. The Giant American History Timeline has 100 ft of timeline pages. If you don’t have that kind of wall space, just put up one era at a time. 3. Do one page at a time. We often run out of time in our days and don’t get everything accomplished but using your timeline doesn’t have to use a lot of time. In fact, with the Giant American History Timeline you could just do one page at a time and spend 10-15 minutes a day. 4. Make it fun. As with everything, it’ll happen more often if it’s fun. 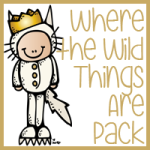 Of course, fun is relative so you’ll have to think of what you and your kids will enjoy. 5. Incorporate it into meal or snack time. This is especially good for younger kids (or hungry ones). You have a semi-captive audience so use it! You can discuss the events, the people, and the effects of the changes. 6. Make it a priority. Ultimately, when we make something a priority, it’s more likely to get done. Hoping and wishing to fit an activity into our day won’t make it happen. But by choosing to make it a priority, it’s much more likely to get done. 7. Use it for Big Conversations. 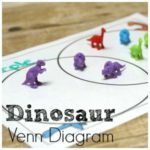 One of the best parts of homeschooling is the ability and time to discuss big topics with my kids. I can play devil’s advocate and help them realize the effects of the past. I found that many of the pages in the Giant American History Timeline led straight into a big conversation. Many of the questions open-ended so we could discuss the answer instead of just finding the answer. We strive to have great conversations daily so it was easy to incorporate the timeline pages into our deep thinking time. Ready to Purchase your own Giant American History Timeline? The books are available digitally or in print. There are pros and cons to each. Printing from the PDF is easy and you could opt to print it as half a page. Your timeline would be more managable for a small area! However, I know I am much more likely to work from a physical book. It’s a hard choice, but you know whats best for you! Use the code TIMELINE20 for 20% off digital purchases! 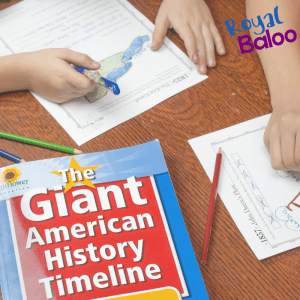 Giant American History Timeline Giveaway!